DEMAND for Shetland Foodbank over the last six months was 40 per cent up on the same period last year, according to new figures. The Lerwick branch gave out 374 food parcels from January to June, helping 544 people. The reason in the increased demand has been assigned to the “slowing down in the local economy with the completion of the gas plant and the Anderson High School”, as well as a growing “awareness and acceptance” of the foodbank. Nearly one quarter of those receiving help were children, and two thirds of all recipients lived in Lerwick. The foodbank said that around two thirds of claims were benefits related, mainly due to delays in receiving payments or cuts to existing benefits. It received nearly 7,000kg of donations over the last six months, with 80 per cent collected at the Tesco supermarket. The value of the donations was almost £12,000. Donations also came in from the Lerwick Co-op, country shop collections, churches and individual donors. Tesco also donated £1,260 through its top-up payments scheme with the Trussell Trust, the national organisation that coordinates the local foodbank. Overall financial donations received in the first six months of the year totalled £5,958, and with expenditure around £4,500, there was a small increase in funds of around £1,500. “This money will however need to be used in the coming months to purchase additional food stocks as these will be required to be able to support the growing demand on our service,” a spokesman for the foodbank said. 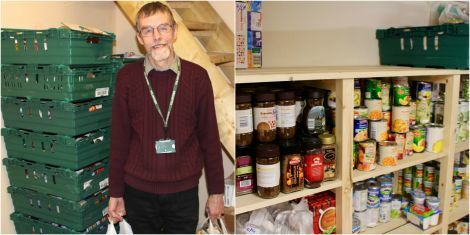 Shetland Foodbank, which is located on St Magnus Street, is currently asking for donations of tinned vegetables, tinned or instant custard and toiletries such as deodorant, shower gel and toothpaste.